Whoever said the dog days of summer were supposed to be slow-paced and relaxing has obviously not spent much time around the MF! Things are moving along at break-neck speed here at the museum -- and that's just the way we like it. 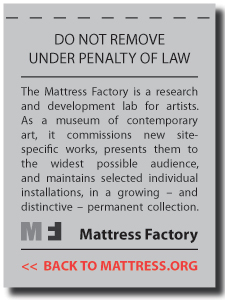 In six short weeks from now Pittsburgh will have hosted a monumental event for a city of our size (the G20 Economic Summit -- more on the MF's role in this below) and the Mattress Factory will have opened two new exhibitions. This pace is not for the weak of heart, so fasten your seat belt and hold on. On September 24 + 25, the G20 Economic Summit will be held here in Pittsburgh. This is a pretty big deal for a city of our size. During these two days in September, millions of people around the world will be watching the proceedings of the summit against the backdrop of our city. Thousands of people (from credentialed media to peaceful demonstrators) will descend upon Pittsburgh in late September and we thought we'd give them a street-level view of the city produced by people on the ground. So last week we (in collaboration with our good friends at deepLocal) launched http://myG20.org, a real-time crowd-curated guide to Pittsburgh. Anyone can participate through several different social media platforms. And if you're not a "My-Twitt-Flick-Face-Tuber," have no fear. We've created a simple web-form that will automatically post your message to the content stream. In the first 90 minutes after we released the link to the MF Twitter Posse, more than 100 people posted to the site. Pretty cool. So cool, in fact, the Pittsburgh Post-Gazette took notice. So check out the site, use it, tell your friends and we'll see how it pans out leading up to and during the G20 in September. Last week we also announced the addition of Greer Lankton’s It’s all about ME, Not You (1996) to the museum's permanent collection. 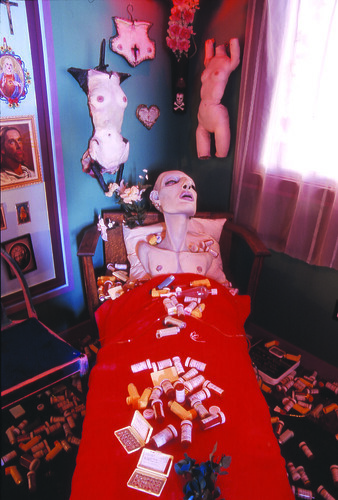 First shown as part of a group exhibition at the museum in 1996, the large-scale installation was recently given to the Mattress Factory by the late artist’s family. Greer Lankton devoted most of her artistic life to creating highly expressive mannequin-like figures with full make-up, wigs, jewelry, and clothing. Her figures populated her tiny studio/apartment in Chicago surrounded by a decorated tableau of stenciled walls, autobiographical drawings, shrines to the likes of Candy darling and Patty Smith, children’s toys, hundreds of fashion magazines, and books on Egon Schiele and other favorite artists. Modeled after her apartment, It's all about ME, Not You opens with a public reception on October 9, 2009. Portraits are everywhere. They are in our wallets; on our computers, cell phones and desktops; on the walls of corporate offices, banks and schools. But what precisely is a portrait or image of likeness? How do artists’ methods and materials evolve as technology progresses with quickly? And in this age of user-generated content, who exactly is the artist? LIKENESS is a group exhibition that aims to examine human depiction during a post-Warholian era in which new technology has played an influential role. It includes the work of artists Jim Campbell, Paul DeMartinis, John Herschend, Nikki S. Lee, Joseph Manino, Greta Pratt and Tony Oursler. Elaine A. King, who is a freelance critic and curator as well as a professor at Carnegie Mellon University teaching Art History/Theory/Museum Studies, will curate the exhibition. LIKENESS opens with a public reception on October 9, 2009. The following is a guest-post by Anthony Roscoe, member of the Pittsburgh Zen Center. Please join us in congratulating the PZC on their ten-year anniversary! Greetings friends! My name is Tony Roscoe and I have been asked to guest blog about an exciting event in Pittsburgh. Next week the Mattress Factory will be hosting the first event to kick off the 10th Anniversary of the founding of the Zen Center of Pittsburgh! I am a member of the Zen Center and sit most Tuesday mornings with a group from our sangha, or Buddhist community, at MF from 7:00–7:40am. But what is all this about Zen you ask? I'll try to explain a little from my understanding. First we have to go to India around 500 BCE, when Buddhism was founded by a former prince who decided that neither a life of hedonism nor one of strict adherence to ascetic ideals really brought about an end to suffering, and instead awakened to what is called the Middle Way. After this awakening, he was called the Buddha or Awakened One. He began teaching others about his experience, and his disciples went on to teach others spreading Buddhism throughout Asia. As Buddhism came through China and into Japan, various schools were formed as those cultures influenced Buddhism and vice versa. In China, the Soto Zen school of Buddhism came into existence with a focus on a form of sitting meditation or zazen called shikantaza, or just sitting. It is this branch of Buddhism that is now practiced at the Zen Center of Pittsburgh and is part of what we are celebrating. Our celebration begins with a sunrise meditation session on Tuesday, August 18 at 6:00am, followed by a walking tour of the community gardens surrounding MF in Pittsburgh's historic Mexican War Streets. On Wednesday, August 19, we'll be gathering at the Friends' Meeting House in Shadyside for an Intro to Zen class from 6:00-6:45pm followed by a screening of How To Cook Your Life, a documentary film by famed German director Doris Dörrie that focuses on Zen cooking and the Rev. Edward Espe Brown. You may well know Rev. Brown from his popular cookbooks such as The Tassajara Bread Book. We'll be joined by Rev. Brown following the movie for a discussion of the movie and a reception. On Thursday, Rev. Brown will be teaching a cooking class at Sweetwater Cooking on the Southside. This hands-on class has limited space so please check our web site and to register as you must pre-register for this event. Our week of events culminates on Friday with a special evening at our Deep Spring Temple in Bell Acres which is just north of Sewickley. We'll be gather for a fundraising dinner and silent auction enjoying foods from the countries that brought us Zen Buddhism. Buddhism was founded in India which will be represented by Taj Mahal from the North Hills. It eventually spread into China represented by Mandarin Gourmet in Downtown; Vietnam represented by Pho Kim 88 in Castle Shannon; and finally into Korea and Japan both represented by Ginza in Oakland. The party continues on Saturday, August 22, among the 14 acres our temple is located on as we have a Family Fun Day with various activities for the whole family. Finally, on Sunday, August 23, we will close our celebrations with a special ceremony and a vegetarian potluck lunch. We'd love to see everyone at any or all of our events. Some do require pre-registration so that we can prepare for everyone. Visit deepspringzen.org for more information and to register for events requiring it. Thank you to the staff of MF for hosting our Tuesday morning sessions and for offering us this online space. May you all be well! Photo Fantasia + A Super-Secret Project! Wow. What a couple of weeks it's been here at the MF! All apologies for having temporarily let the light go out here on the blog. As you can see from the photo sets embedded below, we've been busy beavers lately! And just a hint, we've also been working hard on a very exciting project we'll be able to share with you in a few days. The tentative launch date is sometime the week of August 17th. Like we do with many of our online-based interactive projects (1, 2, 3), we plan to hand it over to the MF Twitter Posse and FaceBook Mob before anyone else gets it. Now onto the photos. On Friday, July 24, we opened the thirteenth installment of the Gestures Exhibition Series. Nearly 400 people turned out, which made for an excellent party, although it did get a *little* stuffy in the galleries =) Artists in the show include Stephanie Armbruster, Jeremy Boyle, Nayda Collazo-Llorens, Jonny Farringdon w/ Allison Whitney Meredith, Victoria Hruska & La Toya Frasier, Gary Huck, Andrew Ellis Johnson, Amanda Long, Lindsay O'Leary, Drew Pavelchak, Renee Piechocki, John Riegert, The Urban Gardener: Joan Kimmel & Lynne Weber, Patricia Villalobos Echeverría and Dror Yaron. As if that wasn't enough, we hosted two sold-out performances (7/31 & 8/1) by the Denver Broncos UK. The concerts took place in the MF basement with set design and video projections by Owen Smith. The band performed flawlessly, the sound was pristine and the set/ambiance was gorgeous. Look for the band's debut release in the very near future. The performance shots in the slideshow below were taken by Haley Harned. Thanks Haley! And check out this awesome Denver Broncos UK set by Joey Kennedy! Thanks for sharing these great photos with us, Joey!